The draft of an Executive Order on US detention and interrogations threatens a nightmarish return to the illegal, immoral, and un-American torture policies of the Bush administration. Its proposed measures — from the re-establishment of CIA “black sites,” to the review of interrogation practices as detailed in Army Field Manual, to the denial of International Committee of the Red Cross access to US detention centers — point to one thing: the resumption of the cruel, inhuman, degrading, and torturous abuse of Muslims. 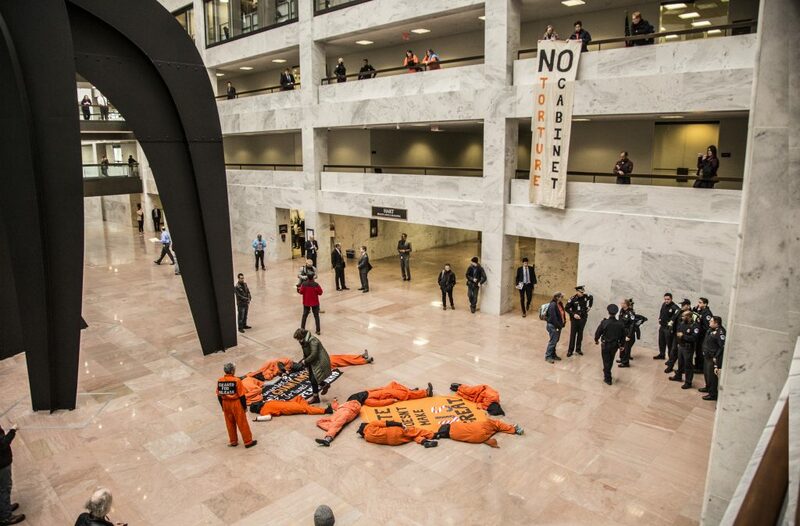 Clad in orange jumpsuits and “Shut Down Guantánamo” t-shirts, activists with Witness Against Torture took over the Hart Senate Building with a message for Senators, staffers, and the general public. They marked the 15th anniversary of the opening of the prison at Guantánamo Bay, Cuba. The message was “Shut Down Guantánamo,” “No Torture Cabinet” and “Hate Doesn’t Make U.S. Great.” These statements were painted on a banner that activists dropped from a balcony as 9 members of the group dressed in orange jumpsuits and black hoods held a die-in, mourning those Muslim men who died at Guantanamo without ever being charged with a crime. The nine, and four others, were arrested by Capitol Police, as supporters sang “O America, don’t believe their lies. Their politics of hate will destroy our children’s lives.” The balconies were crowded with onlookers as the action unfolded. One of the two who unfurled the “No Torture Cabinet” banner was also taken into custody. These actions took place as Senators were hearing testimony from President elect Trump’s picks for Attorney General and Secretary of State, which were interrupted repeatedly by WAT activists. Three of those are now in custody. WAT released a statement reading: “President-Elect Donald J. Trump has nominated militarists for top cabinet positions. He has promised to ‘load up Guantanamo with really bad dudes.’ On the critical human rights and rule of law issues, Trump’s posturing represents backsliding to the worst of the Bush administration’s misdeeds and abrogation of the law. Remembering those who have been imprisoned, tortured and, in some cases, lost their lives, at Guantanamo, Witness Against Torture calls on President Obama to use his last days in office to expedite releases from Guantanamo, and make public the full U.S. Senate Torture Report. We demand that President-elect Trump reject the use of torture, continue transferring men from Guantanamo, end indefinite detention and reject national security or other measures that discriminate against Muslims. WAT urges members of the Senate, in whom the public has placed its trust, to use all their power to uphold the Constitution and the rule of law. You can choose to reject the Trump administration’s nominees and insist that people at the highest levels of government would never advocate for torture. You have the opportunity to repudiate torture, release the Torture Report and acknowledge responsibility for the ghastly abuses that occurred during both the Bush and Obama administrations. Images of Witness Against Torture’s action are available here. Thank you for stating unequivocally that any agency of the U.S. government that starts waterboarding will be hauled into court. It was good to hear you say of our country that we will not torture people, now that Congress has passed a law that is consistent with our decades-old treaty obligations under the United Nations Convention Against Torture. Your statement at the Halifax International Security Forum was desperately needed as Donald Trump prepares to take control of the administration. We at Witness Against Torture have long opposed the abhorrent treatment of the men being held at Guantánamo: both the torture methods used in “enhanced interrogation” and the cruel dehumanizing conditions of their detention. We have visited your office as well as other Congressional offices asking that you release and provide reparations to the men in Guantánamo who have been tortured. The closest we got to that goal was for Congress to acknowledge (in a perversely redacted manner) that torture occurred, with no accountability for the atrocities committed in the name of the American public. We have petitioned the Department of Justice, called and written letters to Attorneys General, and rallied and held vigils outside their doors, demanding that those responsible for justifying and orchestrating the program of torture be investigated and prosecuted to the full extent of the law. At this moment, as Trump is working to pervert the constitution, the Republican party, and the American military, it is refreshing and encouraging to hear you speak loudly in favor of a zero-tolerance stance toward torture. We hope that you will continue to make your voice heard. As long as you continue to do so, we will work to amplify your message and stand with you in the fight for a torture-free America. Witness Against Torture is featured as the cover story for the latest issue of the academic journal, Race & Class. Reprinted here with permission from the author, Chandra Russo, is an excerpt from the beginning of the article. Abstract: The Guantánamo Bay detention camp is a quintessential structure of the US national security state and contemporary Empire. For such imperial formations to proceed as if they are ‘normal’ requires solidarity from various publics. This paper explores what it means to refuse such solidarity through an ethnographic examination of Witness Against Torture (WAT), a group of US citizens enacting solidarity with the men detained at Guantánamo. WAT’s tactical repertoire intervenes in three ways. The Guantánamo prison is not supposed to be seen, but WAT travels there to expose state secrets and the administration’s myth of transparency. The prisoners are not supposed to be heard, but WAT publicly amplifies their testimonies through affectively potent street performances. Indefinite detention and torture are meant to remain distant, but WAT links the plight of detainees to that of Black communities in the US interior. Through these acts, WAT simultaneously reveals and contests the culture of erasure and radical divisiveness upon which the US national security state depends. Fahd Ghazy has been held at Guantánamo for 13 years. He has never been charged with a crime. On a January morning in 2015, so cold that it burns their faces despite the bright sun, a group of twenty has gathered in front of the White House. Many wear orange jumpsuits, some with black hoods. They are spectres of the now infamous images of Guantánamo detainees, kneeling in the dirt behind barbed wire fences: the indefinitely imprisoned. At the end of November 2014, after twelve years of being held without charge, Ghazy wrote an appeal to the American public and gave it to his attorney at the Center for Constitutional Rights to share.2 His is a heart-rending story, if hardly unique. Ghazy is one of eighty-nine men still being held at the Guantánamo Bay mili- tary prison.3 While cleared for release both under the Bush and Obama administra- tions, Ghazy’s detention remains indefinite – in large part because he is from Yemen, a nation with which the US government has a particularly embattled relationship. I have missed the best moments a father could ever enjoy: Hafsa’s first steps; walking her to school; witnessing her successes; helping her when she stum- bles … I am starving for those moments, when she looks at me and smiles or says a kind word or laughs. To read the full version of this very worthwhile article, please visit the Race & Class web site.